Intertops Casino Classic serves customers from most countries in the world, including the United States. While many casinos claim to be US-friendly, some of them have unproven track records, and in a few cases, they turn out to be rogue operators. You don’t have to worry about this with Intertops because it has been accepting wagers over the internet since 1996. When you choose to play in the Intertops Casino Classic for the first time, you’ll be entitled to a 100% up to $100 bonus when you input the coupon code SIGNUP100 and make your first deposit/transfer. Click here to visit the Intertops Casino Classic. Intertops actually runs TWO separate casinos, and you can claim bonuses in both of them. Read our Intertops Casino Red bonus review to learn about the welcome bonus for the other Intertops casino. Keep reading below to find out how to use coupon code SIGNUP100 for a 100% up to $100 matching bonus deal and benefit from many ongoing promos as well. If you wish to activate the SIGNUP100 bonus, then you must enter this code into the relevant section of the website after creating your account but before making your deposit. Visit the Intertops Classic casino today, and sign up for your new account. 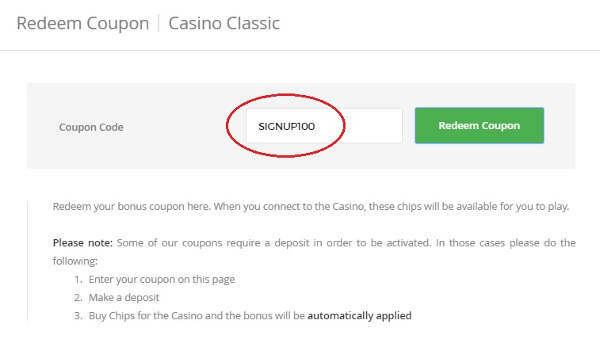 Then browse through the categories on the left of your screen and choose “Casino Classic.” Select “Redeem Coupon” from the menu, and then enter SIGNUP100 in the field as shown below. Click to visit Intertops Casino Classic. Finally, click the Redeem Coupon button to submit your bonus request. Assuming you’ve done everything according to the instructions we’ve described, you’ll see a message confirming the application of the bonus to your account. Now all you have to do is make a deposit of $20 or more. We advise that you deposit the full amount, $100, so that you don’t leave any of the SIGNUP100 bonus money on the table. You can deposit by credit card, but we recommend using Bitcoin instead. Bitcoin is an anonymous, decentralized virtual currency that offers low transaction fees, speedy transfers and freedom from restrictive regulations. 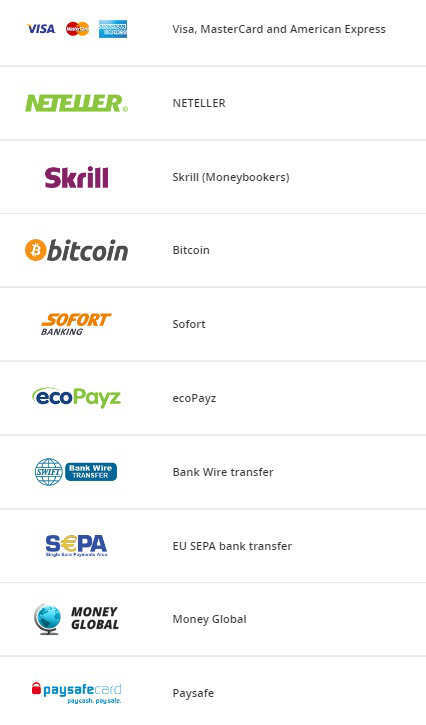 Besides using your card or Bitcoin wallet, you can deposit at Intertops via several payment processors although some of the options are only available to residents of certain countries. In addition to not counting toward bonus playthroughs, roulette and baccarat are expressly forbidden from use with bonus funds. Intertops doesn’t exactly state what will happen if you break this rule, but the consequence won’t be good whatever they are. While a bonus is in effect, you’re not permitted to bet more than $2 on a single slot playline. The limit for other types of wagers is $10 per bet. If you exceed this limit, then any winnings you should happen to win will be forfeit. If you max out the bonus value with a $100 deposit to receive a 100% bonus, then your rollover total would be ($100 + $100) * 30 = $6,000. If you play slots, no further calculations are necessary. If you play blackjack or video poker, though, then your bets will only count 10%, so your effective playthrough requirements would become $60,000. Certain countries are excluded from participating in the new player bonus as well as all other Casino Classic bonuses: Belarus, Bulgaria, Czech Republic, Greece, Hungary, Lithuania, Mauritius, Moldova, Poland, Portugal, Romania, Russia, Serbia, Slovakia, Slovenia, Ukraine, The Netherlands. Even after you’re done enjoying your SIGNUP100 deposit bonus, you still have a lot of ways to pick up some complimentary cash at Intertops. Every Casino Classic player can partake in several recurring deals. Before making any redeposit to your account, check to see if there’s a bonus code available to use. Each month, Intertops releases a selection of coupons for every day of the week so that nobody has to walk away empty-handed. The percentage matches vary a bit, but they’re usually between 50% and 100%. If you want to take a break from bonuses, then you may be interested in the free spins that Intertops makes available through the use of coupon codes instead. Codes granting 100 spins on deposits of $25 or more are common. Anything you collect from these free spins will be added to your bonus balance where it will be subject to a 1x wagering playthrough before you can redeem any winnings. Anyone who has ever made a deposit at Intertops Casino Classic will receive comp points on his or her action. Different games award comp points at rates ranging from 30 per $100 bet to 160 per $100 bet. There are certain games that pay out double comp points, and every month, Intertops will select a few that provide triple points. Whenever you have 2,000 or more comp points, you can trade them in for money with 1,000 points being worth $1. The list of casino tournaments is extensive, and there’s a $100 freeroll every day! The games rotate according to a prearranged schedule, but the $75 daily keno freeroll is a constant. Intertops Casino Classic also hosts low-priced weekly and monthly casino tourneys. 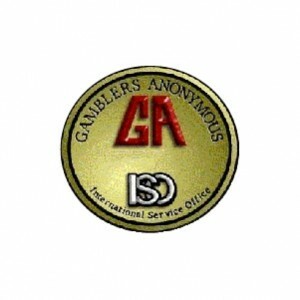 The software used in the Classic Casino is provided by WGS Technologies, an entity that has been around, under one name or another, for nearly two decades. The platform consists of three components: a traditional download casino, an instant play flash casino accessible through the web and a mobile-friendly casino for people with smartphones and tablets. 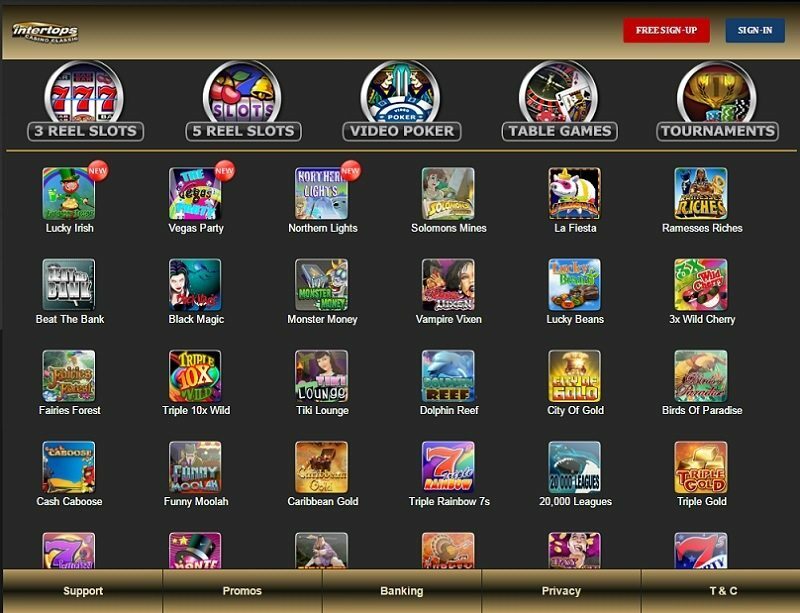 The download package contains the largest number of games while both the web casino and the mobile client have a restricted list of titles. One benefit to the mobile solution over the others is that you can play most games for practice chips without even logging in while the desktop and instant play versions require that you enter your account credentials before getting access to the games. Visit Intertops Casino Classic to play Lucky Irish Now. Lucky Irish may seem pretty simple at first glance, with just a single payline and a maximum bet of three coins, but there’s more beneath the surface than it may appear. 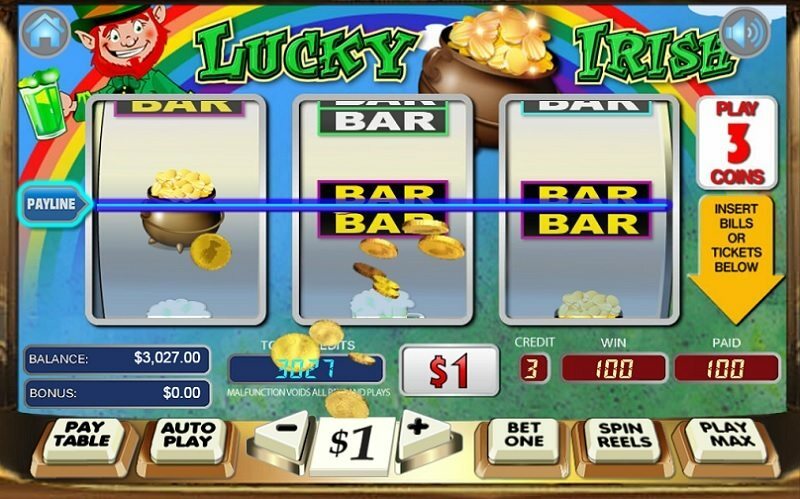 Playing the max bet gives you the chance to win 3,200 coins if three pots of gold show up on the reels, and these same symbols act as wilds, both completing winning combinations and multiplying them. There’s also a bonus game, which is accessible only if you’re playing three coins. This 20-line slot game has an odd theme, combining medicine and romance. You’ll have to match up ambulances, stethoscopes, teddy bears and flowers to score a profit. Collect 2, 3 or 4 Love Meter scatters to begin 10, 15 or 20 free spins respectively. The best part is that you can hit the same scatter payouts while your free spins are running, extending the number of rounds you get to participate in on the house. Search for the treasures contained within 25 paylines, and get five wild compasses in a row to earn 3,000 coins. Free spins with a multiplier await you, and there’s even a bonus game that will see you choose which island to plunder next. Beware of shipwrecks, though, because they’ll end your fortune-hunting expedition. Get $100 a casino bonus and reloads! Besides betting at the tables, you can do so on sporting contests too! Read all about it in our overview of Intertops Sports. Did you know that there’s actually a second casino and associated bonuses for you to play at Intertops? Read our Intertops Casino Red review. If you get tired of playing against the house, then fire up some poker and compete against your peers. Check out our review of Intertops Poker.